Review by AllTheBestFights.com: 2016-07-09, fight not particularly good between Miguel Roman and Jerope Mercado: it gets two stars. Miguel Roman entered this fight with a professional boxing record of 55-11-0 (42 KOs=76%) and he is ranked as the No.7 super featherweight in the world (currently the #1 in this division is Jason Sosa) while his opponent, Jerope Mercado, has an official record of 27-7-3 (9 knockouts). Roman suffered his last loss when he faced Dante Jardon in 2012, since then he has collected 17 consecutive victories beating Yogli Herrera and Juli Giner in 2016 (=Roman vs Giner). 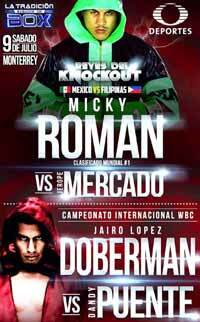 ‘Mickey’ Roman vs Mercado is the main event of the evening. Watch the video and rate this fight!